The CRF250 RALLY is ready for weekend adventure, long distance tour or the daily commute. With long travel suspension, large-disk ABS brakes, excellent weather protection from the CRF450 RALLY-inspired bodywork and an impressive cruising range. Engine performance combines solid bottom-end torque with substantial top-end power. It brings the spirit of Rally-raid racing to every ride. The rally racer replica segment is an exciting one for Honda; with the global, human appeal of everything that Team HRC is fighting to achieve in the Dakar Rally. Built on the capabilities of the CRF250L, the CRF250 RALLY opens up new opportunities for riders young and old. So, with the CRF250 RALLY is a motorcycle that looks like HRC's CRF450 RALLY factory machine, is fun to ride both on and off-road for weekend adventures, comfortable to tour with and useful and practical for daily life. 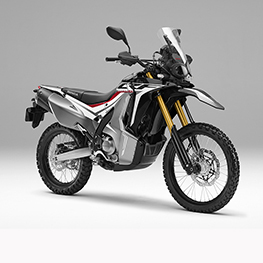 A 250cc dual purpose motorcycle that covers many bases: it slips easily through congested city traffic thanks to lightweight and slim proportions matched with superb manoeuvrability, while its suspension, ground reach and seat height deliver a fun and comfortable ride on rough tarmac and trails. It opens up a whole new range of two-wheeled opportunities, whatever the rider's experience level. The CRF250 RALLY is designed to cover distance and its styling reflects this. Derived from the parts used by the CRF450 RALLY, the 'floating' screen, upper/lower fairing and side shrouds effectively shield the rider to offer excellent defence against the elements. Hand guards offer further protection, both for the hands and the brake and clutch levers. From the machine's mid-section back, the style is MX-sharp, with side panels and a seat/tank interface that help the rider move freely. A skid plate protects the machine's underside and the gear lever features a folding tip. Seat height is 895mm, 20mm taller than the CRF250L. The headlight is a compact, asymmetric dual LED unit while the rear light, LED indicators and number plate bracket tuck discreetly away. The CRF250 RALLY's 250cc liquid-cooled single-cylinder DOHC engine's performance is focused on bottom-end torque and high rpm power, plus a linear delivery. Peak power of 18.2kW is delivered @ 8,500rpm with peak torque of 22.6Nm arriving @ 6,750rpm. The PGM-FI feeds the fuel/air mixture through a 38mm throttle body and draws air from the airbox via a direct connecting tube. The exhaust muffler has a diameter of 115mm, houses the catalyzer and uses two chambers. A large-bore downpipe helps the engine breathe and make more power. The CRF250 RALLY's frame is constructed from steel, with twin oval-section main spars and a semi-double cradle. A wheelbase of 1,455mm is matched to a 28.1º rake with 114mm trail and ground clearance of 270mm (15mm more than the CRF250L). Wet weight is 157kg. A new 43mm Showa inverted fork shares the same 250mm stroke as its sibling, but with 50mm extra overall length. Light weight and rigid, one side houses the spring while the other provides damping control. Both spring rate and damping have been optimised to suit the CRF250 RALLY's adventurous long-distance aspirations. A 17mm front wheel spindle (2mm larger in diameter) improves strength and handling feel. Ideal for learner riders, the CRF250 RALLY is LAMS approved (learner approved).